Whether or not people want to admit it, most start out as a gambler within the markets. Sure, it may not be intentional, but when you don’t know what you don’t know… odds are… you are doing something that is essentially gambling. How do you evolve away from this? What types of ups-and-downs does this bring along with it? We go into this and much more with our guest Jim (chatroom alias of ‘farmboy’). Jim experienced the world of penny stocks for a while before deciding to climb out of that mud pit and then from there still had plenty more lessons to learn. 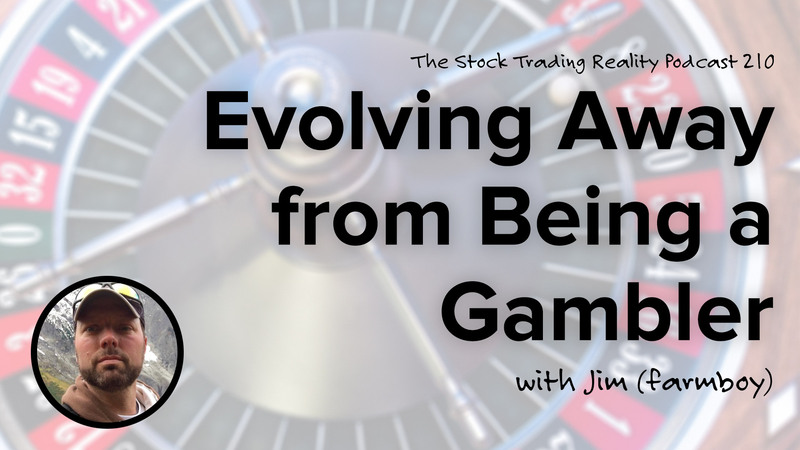 Jim is currently trading with real money as he builds up good habits which can eventually be scaled into larger trading amounts. There are some key talking points that our discussion brings about, so be sure to listen carefully so you don’t start comparing apples to oranges. Let’s get to it! Today we talk to community member Jim who goes by ‘farmboy’ in the chat. When he started his first job he was able to buy into a 401k. He was limited to 3 funds and focused on the ones with the best percentage returns. Most of the capital Jim had was in safe investments such as mutual funds and various diversified funds but allocated a small amount for speculation. He did dabble in penny stocks but learned a valuable lesson regarding liquidity very quickly. Eventually, Jim realized that he needed to learn much more about trading and dove headfirst into Claytrader University. After going through the penny stock course, he decided to leave the penny stocks alone and move onto more liquid products. Jim doesn’t paper trade because it doesn’t evoke any emotions. He believes he wouldn’t make the same decisions without having money on the line. Moving forward he would like to focus on swing trading since he still spends a majority of his time working on his farm. I knew the power of compound interest. As far as the market it is, it’s still mystical to me. Kind of like an addicted gambler. Even though I know I’m throwing my money away to a certain extent, maybe I can make it on the next one. Even though I still don’t know what I’m doing, I’m still trading. I just can’t stop myself. I want to get more into swing trading. I just haven’t gotten up to those courses yet. I found myself not wanting to honor stops but realized I need to let it go and let the stop happen.